New Red Dead Redemption 2 information keeps pouring out after Rockstar’s meeting with select press outlets. Yesterday we wrote about the developers’ effort to make players feel like the van der Linde gang is real. Now, French website JeuxActu managed to sit down with Rockstar’s Rob Nelson (Co-Studio Head and Art Director) and an incredibly in-depth interview resulted from that chat. 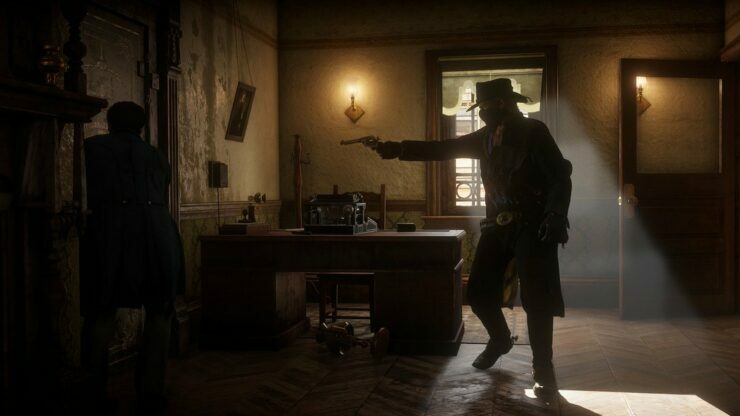 Below we’ve highlighted his description of the evolved NPC system we’ll see in Red Dead Redemption 2 and how the player’s interactions can organically result in the discovery of certain activities. Being immersed in a credible world with a captivating story, capable of engaging the player, while giving them the freedom to lose themselves, then returning to the main quest in a natural way, is something important for us. And that was our main goal for Red Dead Redemption 2, to erase the boundaries between all these aspects to make it coherent and organic. Everything must appear natural, without any transition or lag, to reinforce the sense of immersion and connection between each mission. For example, in the camp, a simple conversation with an NPC can result in a bank robbery, or reveal important details about the story, background, and thus trigger a new mission that the player may want to do right away or later. Simply leaving the camp to search for supplies may allow the player to discover other interesting activities or other goals. Everything is done to reinforce the feeling of embodying the character Arthur, an outlaw who is part of a famous gang, not to mention that everything must remain as entertaining as possible. The gang needs money to do this, you will have to carry out missions as diverse as various to rob banks, intercept trains, steal from people, hunt, but also resell. There are 1001 ways to make money, even outside missions, in an honorable way, and less respectable too, to let the player do what he wants. You can kill people to steal their money, but you can also threaten them and extract their currency less violently. To leave the choice to the player is very important for us. It is not a Manichean system, it is not good against evil, everything is nuanced. Of course, we play Arthur and he has his own character, but you are given the opportunity to shape his way of behaving a bit. The idea of the gang, the camp, the interaction between the characters, those with whom there will be cutscenes, the way the horse behaves, which must be in osmosis with the attitudes of Arthur. The animal has a high level of interaction with the character, depending on your reactions. This is also valid with other animals. In the demo, you could see a deer grazing, raise his head as Arthur approaches him. If you are never a threat to him, he will continue to eat quietly. On the other hand, if you shoot him, there will be several different animations. Nelson also revealed something that should make Rockstar fans very happy. While their open world games have long been incredibly detailed, the interiors always suffered a bit by comparison; this shouldn’t be the case anymore. For Red Dead Redemption 2, we tried to go further in the interiors. You can go into a house, open the drawers, take the jewelry in the drawers. Small things in even smaller things, so that the world is the deepest and most credible possible. From big coffers to small pockets in people’s jackets, you can steal everything, without ever knowing what you’re going to fall on. We tried to create a consistent world in which it is possible to jump and hold onto a train running at full speed, enter the cars, find a bag, open it and take what’s inside, come out the train without being spotted, all this will be possible. These are lofty goals for sure, but it’s Rockstar we are talking about. If there’s any developer that can pull it off, it’s them. Red Dead Redemption 2 will be available for PlayStation 4 and Xbox One starting October 26th.